In recent years Hazardous Substances (HS) such as lead and cadmium have received a lot of press for the harm they can cause (health risk, environmental effects, etc). In response to this, a number of regulations have been developed to protect children from excessive contact with hazardous substances and limit the amount of heavy metals that are put back into the earth. These various regulations (RoHS, CPSIA, etc) affect a wide range of industries and have created a demand for fast, on-site screening methods to accurately detect levels of banned substances and x-ray fluorescence has grown into a popular, low-cost, testing solution. affecting children product manufacturers, distributors, resellers, etc. affects the electronics industry and requires verification of lead in solders, etc. The SOLUTION to Hazardous Substance Testing? Depending on your product line and what regulations are of concern, Quickshot XRF can offer two different styles of XRF Analyzer to meet these testing requirements. Handheld XRF and Desktop XRF systems offer different benefits to end-users. 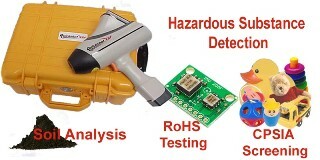 Handheld XRF Analyzers have become one of the most popular methods of screening product for the regulated metals because the technology provides a cost-effective mobile testing device that is not limited by sample size and can detect levels of banned substances well below the regulated parts-per-million (ppm) levels. The Quickshot XRF handheld system can read down to single ppm levels in specific applications. Quickshot XRF’s handheld system (QSX-HH) provides a cost-effective way for organizations to take control of their compliance testing program. The analyzer limits the need for outside testing resources and allowing for accurate results to be in the palm of your hand. Among its many features, the major benefit of the QSX-HH is the easy to navigate software package for hazardous substance testing. Real time results are shown on the PDA and can be transferred to a desktop computer for long-term storage, analysis and report generation in Word/Excel. Another option for hazardous substance testing is the desktop QSX-82D analyzer. This system is most popular for testing of electronic components because of the sensitivity it provides along with its ability in small spot-size analysis. If your industry is affected by any hazardous substance regulations and you require a cost-effective way to monitor your incoming materials or outgoing product; please contact Quickshot XRF.